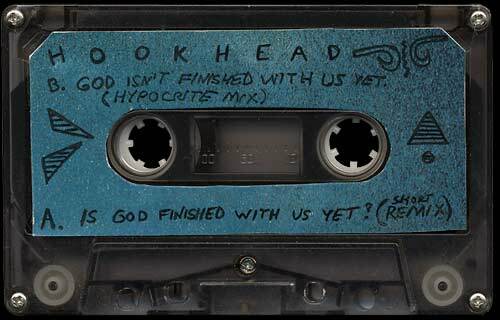 The HooKHead Project - Cassette Releases - God Isn‘t Finished With Us Yet/Is Got Finished With Us Yet? The first ever recording that started it all. This cassette is roughly ten minutes per side and was designed to be looped while playing from the inside of a piece of sculpture. The sounds were derived and collaged together from AM radio religious broadcasts as well as cable TV news and advertising. Strange socio-political dialogue was spliced together by using two tape decks and lots of pausing and cueing between them. Literally this is a verbal collage with some other sounds dropped in for effect and to pace the phrases apart. I had no access to reel-to-reel multi-track tape so no actual physical cutting could be done. It was all done with cheap off-the-shelf consumer cassettes. I used this technique for years to come, until I got a 4-track and software for sampling. 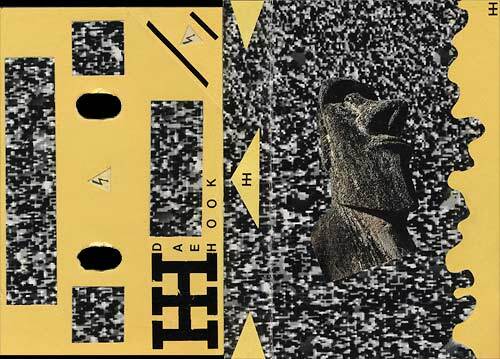 The HooKHeaD Project (hook hed proj'ekt) n. 1. Music: experimental - electronic - industrial - acoustic - ambient - ethnic. 2. Thinking music 3. An ongoing soundtrack of one individual's life.